It’s time for the annual Happy Harry Potter series celebrating Harry’s birthday, hosted by Marissa of Rae Gun Ramblings, so I decided to combine a fun tutorial swap with something a little Harry to celebrate! Am I right? 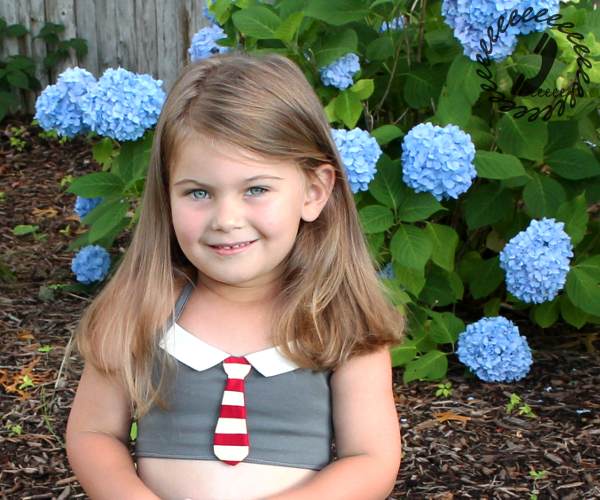 The crop top pattern is available as a FREE download from my friend Melissa of Rebel & Malice in size 4. She designed it as a Rockabilly inspired top and the shape is adorable. I joined in a blogger tutorial swap where the idea was to take a tutorial from your partner’s blog, follow it, and post about what you made. I was paired up with Melissa and as soon as I saw the crop top I knew I had to make one. Bean is just about out of most size 4’s so it’s a bit snug, but the elastic in the back means it’s still comfortable to wear. I think the back view is my favorite. Plus Bean got her hair cut last week so she can finally wear it down without it getting into a thousand tangles so it’s nice to see some pics with her hair not pulled back, hehe. The tutorial was super easy to follow and the steps were clear. The seam allowance I used was 5/8″ and everything fit perfectly together. 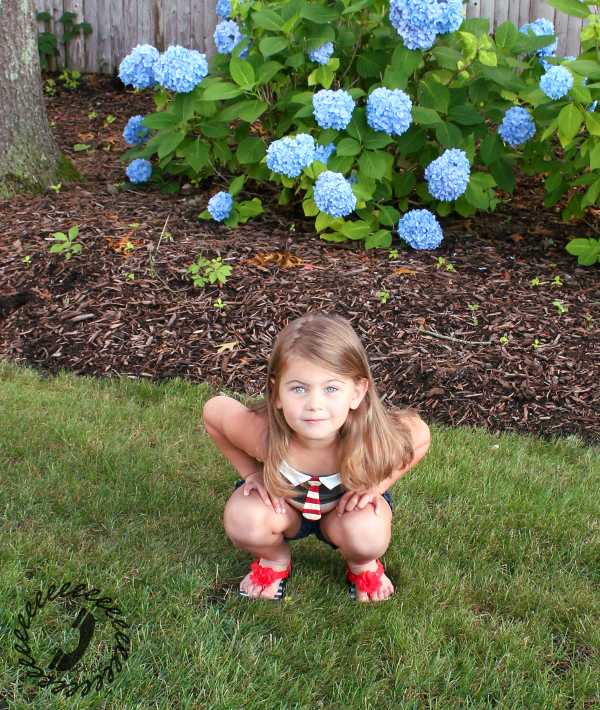 Bean is wearing the crop top with her Paneled Sunsuit Shorts which is a cute combination. When I was trying to come up with something fun for this year’s Harry Potter Celebration (remember this fun Invisibility Cloak from last year? 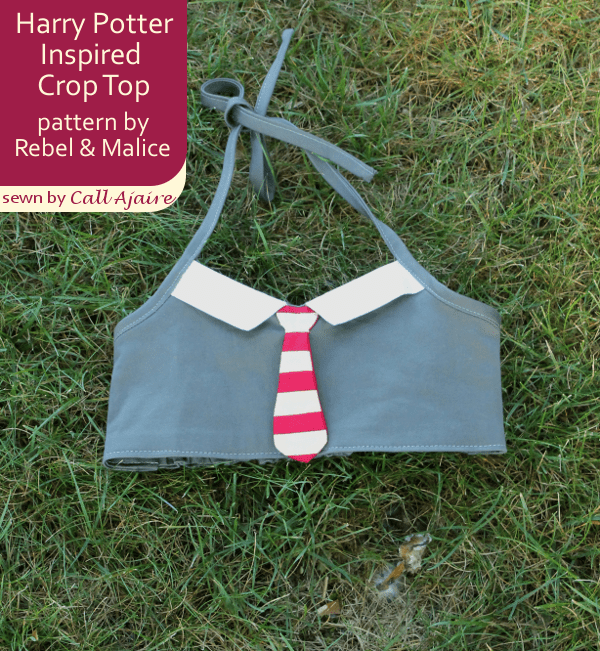 ), I was a bit stumped until I saw the little shirt collar pieces on the front of the Rebel & Malice crop top. I thought it’d be cute to add a tie and sew it up in Griffindor colors and am so pleased with how it turned out. The tie is attached at the top of the bodice and I tacked it down around the “knot” section, but the rest of the the tie is free to move which just adds to the cuteness. Are you excited to see more Harry inspired goodness? Click through to Rae Gun Ramblings for the rest of the fun series. And of course there’s a fantastic giveaway for the Happy Harry Potter series and the winner will receive the following awesome Harry Potter and bookish prizes!